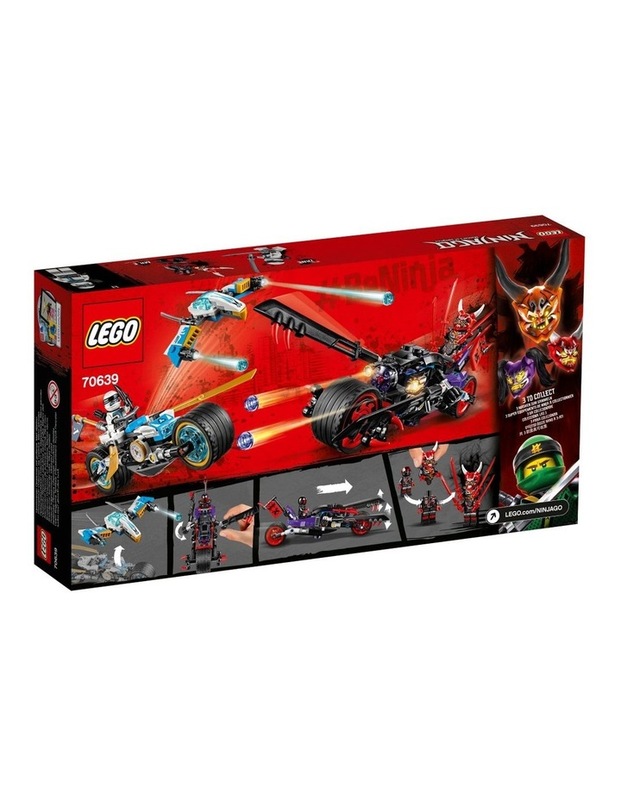 Includes 2 minifigures: Zane and Mr. E. Zanes bike features a minifigure seat, 2 stud shooters on a foldout, detachable drone, 2 foldout gold-colored blades, a flag element and translucent, ice-blue elements. 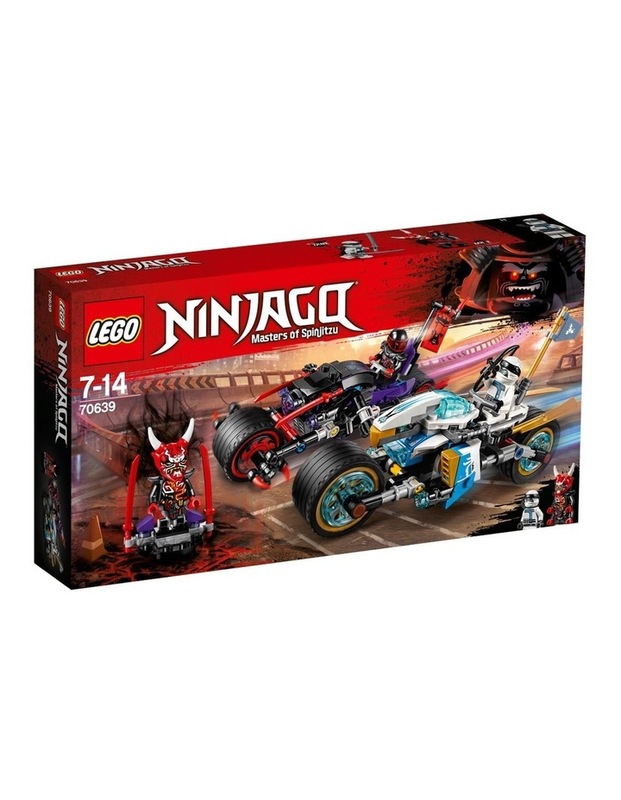 Oni Bike features a minifigure seat, 2 chopping blades with spikes, 2 stud shooters, front wheel with spikes, 2 detachable swords and a `Sons of Garmadon' flag element. Push the Oni Bike along to make the blades chop. Also includes a podium with the Oni Mask of Vengeance and Demon Torso transformation elements for Mr. E, plus 2 katanas. Attach the Demon Torso (with 2 extra arms) and Oni Mask of Vengeance to Mr. E to make him even more evil! Includes Zanes bow-and-arrow weapon. 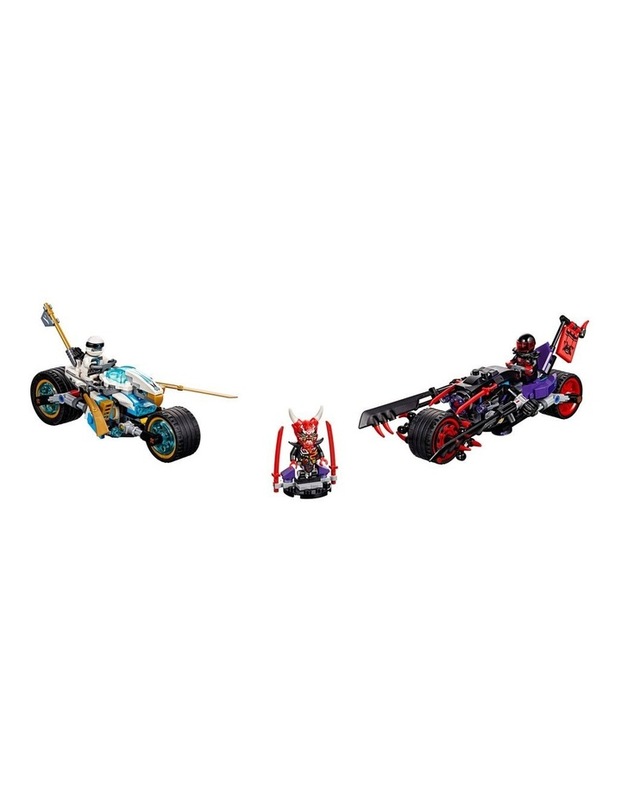 Recreate and role-play epic scenes from the NINJAGO Masters of Spinjitzu TV show. This cool toy for kids is suitable for ages 7-14. Zane's bike measures over 3 (9cm) high, 6 (17cm) long and 2 (6cm) wide. Detachable drone measures over 4 (11cm) long and 3 (9cm) wide, and under 1 (2cm) high. Oni Bike measures over 3 (9cm) high, 7 (18cm) long and 2 (7cm) wide. Podium (including mask and torso) measures over 1 (5cm) high, 1 (4cm) wide and 1 (3cm) deep. As seen in the LEGO Ride Ninja TV commercial.